This set consists out of two component addition cure silicone that cures to a relatively hard but still very flexible transparent slightly yellow silicone rubber. This is ideal for stable moulds or even to toughen the silicone colorless 5 when mixed. Siliconen addition colorless 50 are ideal to make stable flexible moulds. The Silicones A Crystal clear 50 is a 2-component (Platinum) addition curing silicone which cures at room temperature. Because of the low shrinkage and very low hardness combined with good strength these silicones are suitable for mask making and for molds of delicate castings. 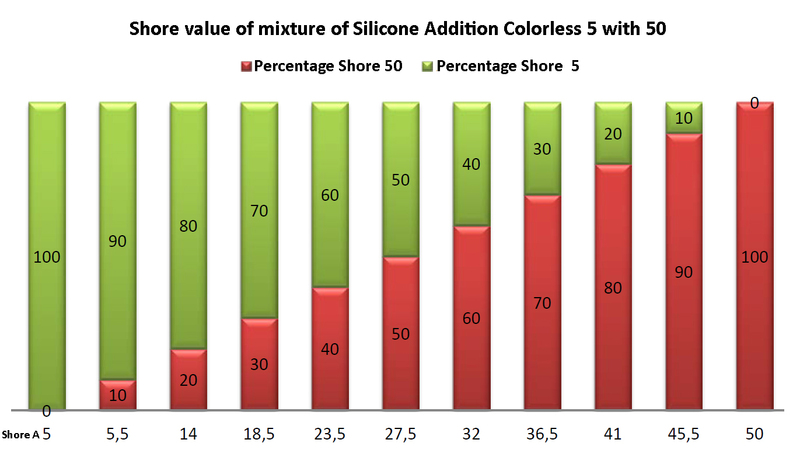 This shore hardness of this silicone can be adjusted by adding the Silicone Addition Colorless 50. If you combine a mixture of the Shore 5 with a mixture of the Shore 50 you get a shore hardness between 5 and 50. For example: For 100 grams of Shore 18,5 you need 35 grams of Shore 5 A component 35 grams of Shore 5 B component together with 15 grams of Shore 50 A component and 15 grams of Shore 50 B component. Trapping of air bubbles can be prevented best by placing the silicone under vacuum immediately after mixing. To prevent air bubbles, stir the A and B component well but slowly without stirring in air. We advise to use a figur of 8 motion. If you want to reduce the Shore (hardness), you can add silicone oil from the shop. Please note that oil does not bind to the silicone network and may over time bleed from the silicone. If you do not want to pour the silicone spatula but you can add Silicone Thixo A (note: not Silicone Thixo C !!). You can also add fumed silica. You can silicone intense colors with silicon dye. Please note: This is an addition curing silicone. This type of silicones may experience cure inhibition when coming into contact with sulfer, nitrogen, amino groups and metl salts. If you are not certain that the products you use (including gloves, spatulas and cups) contain these ingredients, please do a little test first! These components are often found in many latex gloves, some platicines, glues, laquers, condensation curing silicones, silicone caulk, natural rubbers and 3D printing materials (mainly stereolithography). If you still want to use such materials you might have to brush on a protective layer of poly vinyl alcohol. The products are packaged in sets of 1kg, 2kg, 9 Kg, 40 Kg and 400 Kg. The components can not be ordered separately. If you use silicone frequently we advice the use of gloves and to work in a properly ventilated area. For safety information see the safety data sheet.